During World War I more than 8 million men passed through the on their way to the front. In the 1930's passenger traffic boomed. In 1933 some 75,000 people passed through Southampton. So did imports of fruit, potatoes, grain, timber and wool. Many manufactured goods were exported from Southampton. 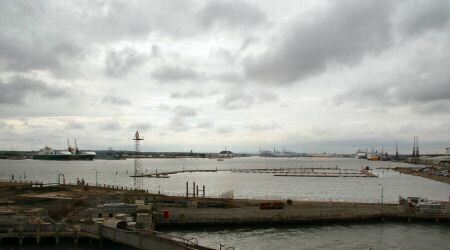 The booming port meant that Southampton escaped the worst of the depression. General motors opened a factory on reclaimed land by the Itchen in 1938. The civic centre was built between 1932 and 1939. In 1938 a new sports centre was opened at Bassett. During World War II Southampton 631 people were killed by bombs. More than 4,000 houses were destroyed as well as many shops in the High Street and above Bar. High Resolution picture available for download. All pictures are of course protected by copyright. Feel free to look at them. If you want to put them to commercial use then ask us first!